Inside: The Shadow does battle with The White Count! The year is 1965 and it is nearly Christmas and at nine years of age, this was to be my first comic annual. 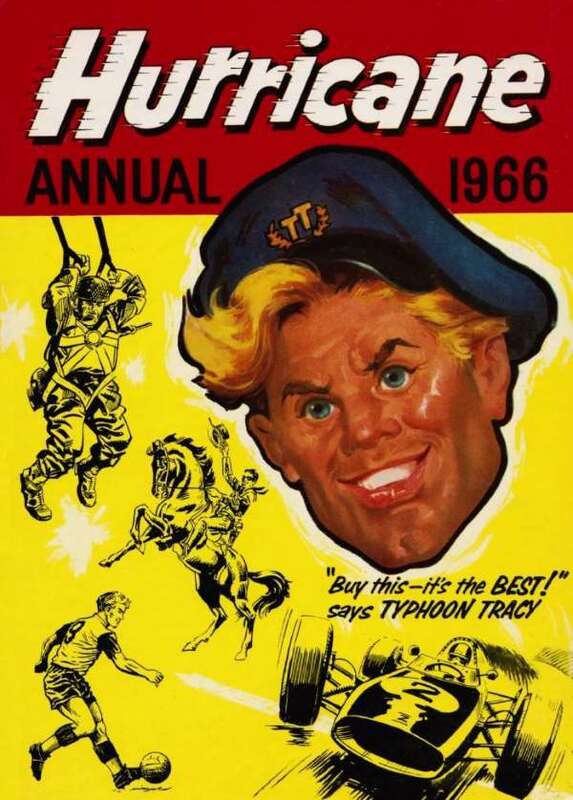 Hurricane was my second comic, my first being TV Comic, which included Popeye, Mighty Moth, TV Terrors and more. I was a little upset when in 1966 Hurricane joined Tiger, but on offer was, 'The Wembley Whistle.' Must have driven my family mad blowing the whistle for weeks. Back to the Hurricane Annual. Published by Fleetway Publications in 1965, priced 9/6, 128 pages of thrills and adventure. Starring Typhoon Tracy : Skid Solo : Sergeant Rock : The Shadow : Bruce Kent : The Quest Of The Juggernaut : The Black Avenger : Island Of Evil : Birk 'N Ed : The Volunteer : Rod The Odd Mod : H.M.S. Outcast : Soccer Sharp Shooter. There was some fantastic stories both in written and comic strip format right through the annual. Here are a few to wet your appetite. The Black Avenger And The Stolen Gold Mine: Johnny Bishop alias The Black Avenger once more has to don his mask to avenge the wrongful imprisonment of an ageing prospector accused of murder. Can Johnny save him before he is hung at the Gallows. The Shadow Verses The White Count: The honorable Basil Blythe alias the Shadow, a mysterious detective of dark Victorian London, does battle against the White Count a villainous jewel thief. Can he stop the evil jewel thief from pulling off the crime of the century. There is also three great true life stories. The Man In The Iron Mask : Admundsen Conqueror Of The Poles :The Man Who Walked On Air, which is my favourite of the three. Daniel Home a Scotsman living in America, is seen on numerous occasions floating in the air. He travels to Victorian London and Europe to prove the sceptics wrong. An amazing story and at nine years of age I was well and truly gob smacked. No more to be said. If you see Hurricane Annual 1966 - Buy It - You won't be disappointed!